Product prices and availability are accurate as of 2019-04-16 21:04:30 UTC and are subject to change. Any price and availability information displayed on http://www.amazon.com/ at the time of purchase will apply to the purchase of this product. LAST-N-LAST MARINE AND DOOR SPAR VARNISH Designed to afford wood the best possible protection from the harsh sun and salt spray of the sea. Contains ultraviolet screening agents specifically formulated for exterior use. Also provides outstanding protection for other exterior wood surfaces around the home. Also great for exterior doors, patio furniture and childrens outdoor toys. This Last n Last Marine & Door Spar Varnish is one of many top quality items in our Clear Finish Polyurethane department. Especially useful for treating doors, patio furniture with a clear, tough, beautiful finish. Free-flowing and self-leveling and resists peeling, chipping. Application: Marine & Door. Approximate Drying Time 7 Hours. Self Leveling. Container Size: 1 Qt. Finish: Satin. Designed to afford wood the best possible protection from the harsh sun and salt spray of the sea. Contains ultraviolet screening agents specifically formulated for exterior use. Also provides outstanding protection for other exterior wood surfaces around the home. Also great for exterior doors, patio furniture and childrens outdoor toys. 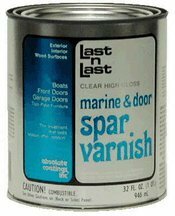 This Last n Last Marine & Door Spar Varnish is one of many top quality items in our Clear Finish Polyurethane department.